More than 40,000 listeners have enjoyed this story on cassette. Now anyone who's ever dreamed of getting away from it all can enjoy the charms and challenges of A Year in Provence on CD! Peter Mayle and his wife had been to Provence as tourists. They had dreamed of one day trading the long, gray winters and damp summers of England for the blue skies and sunshine of the coast of southern France. And then they made it happen. They moved into an old farmhouse at the foot of the Luberon mountains and embarked on a wonderful, if at times bewildering, new life. Among their experiences that first year: being inundated with builders and visitors, grappling with the native accent, taking part in goat races and supervising the planting of a new vineyard. 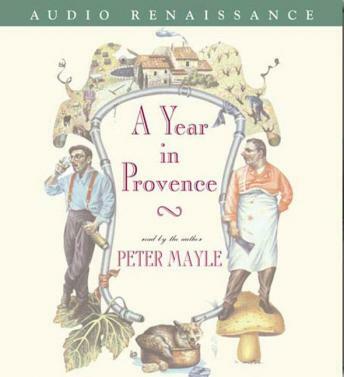 Peter Mayle personally recounts the pleasures and frustrations of Provençal life--sharing in a way no one else can, the unique and endearing culture that is Provence. If I hadn’t already read the paper copy of this book I would be even more disappointed. I was so disappointed in the quality of this recording. It seems to me that The recording was sped up so much that it was hard to understand a word he said. The only way I understood any if it was having been familiar with the book already. I was so excited to see that the author was the narrator but was quickly disappointed once I realized the recording had apparently been tampered with. I’m afraid that these recordings will not garner any new peter mayle recordings. This book was light and amusing. I highly recommend it if you enjoy good food and envision what it's like to live in Provence. This was a fun book! Short and funny. If you love food, you will especially love hearing all the stories.